There are many potential benefits to installing toilet safety rails into your home bathroom. They include an increased level of safety, ease of getting up and down from the toilet, and comfort while actually using the toilet. As an elderly person or a person living with physical disabilities, a fall in a bathroom can be extremely dangerous. It can often result in the inability to get up, forcing the injured person to lie on the floor for hours or even days. Sometimes, this can even result in death due to either the gravity of the injury or the deprivation of food and water. Adding safety rails to your toilet can easily prevent this type of fall by providing an anchor for climbing up and down. The sturdy, padded arms mean that you don’t have to balance entirely on your feet while sitting down. No one wants to fall and hurt themselves, possibly even breaking or fracturing a hip or elbow. But it’s much worse when it is inside your own home, as the possibility of getting immediate medical help is greatly reduced if you cannot recover on your own. Another benefit to these railings is that they make it easier to get up and down, without having to strain your joints. For many elderly people, the motion of sitting up and down without an anchor for their hands can be extremely painful. Safety rails eliminate this by providing a firm foothold to the ground, increasing coordination and balance and reducing strain on the joints, particularly the hips. 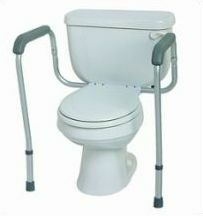 There are adjustable toilet safety rails that can be raised and lowered according to your own preferences. If you add safety rails on top of a raised toilet seat, you will have the best toilet seat that offers both safety and comfort. Insurance is not likely to cover such an item because it is considered a personal convenience item. However, at just $30 to $40, toilet safety rails are a wise investment for anyone who struggles with joint pain or could be seriously injured by a fall, preventing thousands in possible medical bills. If you are looking to buy toilet safety rails, here are a few of the recommended and best toilet safety rails. Pay careful attention to the rail installation and size of the toilet. These are the best prices found online for these particular styles of safety rails. Screw On Toilet Safety Rails – This is an ADA complaint toilet rail with stable 8 inch high armrests. It is also rustproof and easy to clean. Fits most standard toilets. 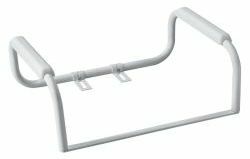 Adjustable Height Toilet Safety Rails – This rail can support up to 250lbs and is larger than the previous one. It is also slightly more expensive. However it is a lot easier to install and has two footrests that provide more stability. 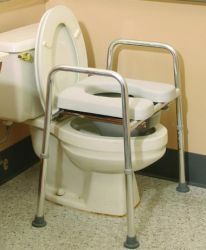 Raised Toilet Frame With Padded Seat – Supports up to 300lbs and can function as a bedside commode and a raised supported toilet seat. The seat is padded for extra comfort. No tools are needed for assembly. This is also a raised toilet seat with safety rails. Comfort is another reason to add toilet safety rails to your home bathroom. Many models come with foam armrests, allowing you to rest your arms in a natural ergonomic position, instead of slouching over. This not only keeps your back feeling great as it promotes good posture, but it can promote circulation in the arms by keeping them more straight.